Updating Blog regularly is one of the effective content marketing strategy in the present eCommerce marketplace. This activity will draw the more interactive website and drive your website more attractive to the visitors. Magento 2 Blog extension by Mageplaza, you will get an impressive chance to provide the latest news about your store, upcoming products, promotions, and get customers’ feedback in easy and simple way. Here we go how to know detail in instructions and configuration in extension’s backend. In the Enable field: Choose “Yes” to turn the extension on. In the Url Suffix: Enter the Url Suffix. There won’t be no suffix if you leave it blank. 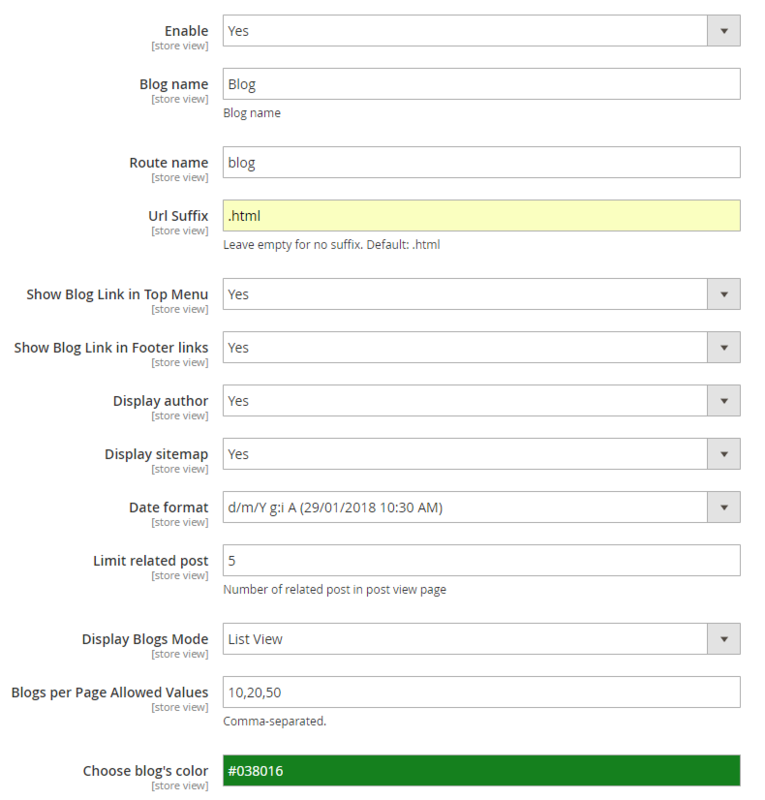 In the Show Blog Link in Top Menu field: Choose “Yes” if you want to show blog links in the top of the menu. In the Show Blog in Footer Links field: To make the blog link visible on footer links on your site, set “Yes”. In the Display Author field: Select “Yes” to display name of post’s author on the frontend. In the Display Sitemap field: Choose “Yes” to display sitemap at the footer links. In the Date Format field: Choose the date format to display. We have 12 types of date format. Related Post is defined posts have the same Topic. You’re able to limit the related posts in this section. If you leave it blank, all the related posts will display on Post View page. In the Display Mode field: You can configure to display posts in Grid View or List View. In the Blogs per Page Allowed Values field: The number of post per page will be set in this field. In the Choose Blog’s Color field: Pick up a color for your blog’s text. When open the Related Products Content section, there will be two sub-section parts. Product Detail Page contain posts can be added to Related Products to display in Post View Page. The selected products will recognize those posts are Related Posts and display them on the Product Detail Page. In the Enable Related Post field: Choose “Yes” to show related posts on Product Detail Page. In the Limit of Related Post field: Enter the number of related posts can display. If you leave it blank, the default number is 1 post. In the Enable Related Product field: Choose “Yes” to show related products on Post View Page. In the Limit of Related Products field: Enter the number of related products can display. If you leave it blank, the default number is 12. Expand the Sidebar section, there will be two sub-section parts. In the Number of Recent Post field: Enter the number of recent posts that display on the sidebar. If you leave it blank, the default number is 4. In the Number of most view posts field: Enter the number of most view posts that display on the sidebar. If you leave it blank, the default number is 4. In the Sidebar Location: Select Left/Right for the location of the sidebar. In the Enable Search Box field: Choose “Yes” to active the search box at the sidebar. In the Maximum Query Result field: Enter the maximum number of posts that the search box will search. Without setting the limitation, the search box will search all posts that match the search character. In the Min Chars field: Search results will only be displayed if the customer enters in the search box with enough configured characters in this section. In the Visible Image: Select “Yes” to display the thumbnail of the post when the post is found in the search box. In the Description length field: Limit the length of the short description can show along with found posts. If you leave it blank, the short description will not display. Monthly Archive helps to summary the number of post published for each month. Open Monthly Archive section. In the Enable Monthly Archive field: Select “Yes” to display the monthly archive on the frontend. In the Number of records field: Set the number of months to display on the frontend. If you leave it blank, the default number is 5 (the last 5 months statistic). In the Type of Datetime field: Choose your favourite format of the date. We offer 4 types of month/year displays. Open Comments section, set a comment type with one of the following options. Default Comment: Customers need to login a new account to be able to comment, admins can manage those comments in the backend. Choose ‘No’ at the Need for Approval field to disable the comment management feature. After that, those comments will be shown on the frontend as soon as customers comment. Disqus Comment: Admin needs to create a Disqus unique name and fill it in the configuration. This also requires the customer have a Disqus account to be able to comment. In the Facebook: Number of Comment field: This limits the number of comment displaying on the Post View Page. If you leave it blank, it will show all available comments. In the Facebook: Color Scheme field: Choose the color which display commenter’s information. In the Facebook: Order by field: Choose the arrangement for comment displaying. * Social: The comment which has more like(s) will display from the top. * Reverse Time: The comment which is published first will display from the bottom. * Time: The comment which is published first will display from the top. Disable Completely: choose this type if you don’t want to display comments. Open SEO section, there will be 2 additional sub section in this part. In the Enable field: Choose “Yes” to enable Article Snippet. In the Organize or Website Name field: Enter your organize or website name. In the Logo field: Upload your logo. Open the Social section: * In the Enable field: Enable social buttons on the blog page * In the PubId field, insert ID for Share buttons that get from https://addthis.com. Click on Save Config when complete. 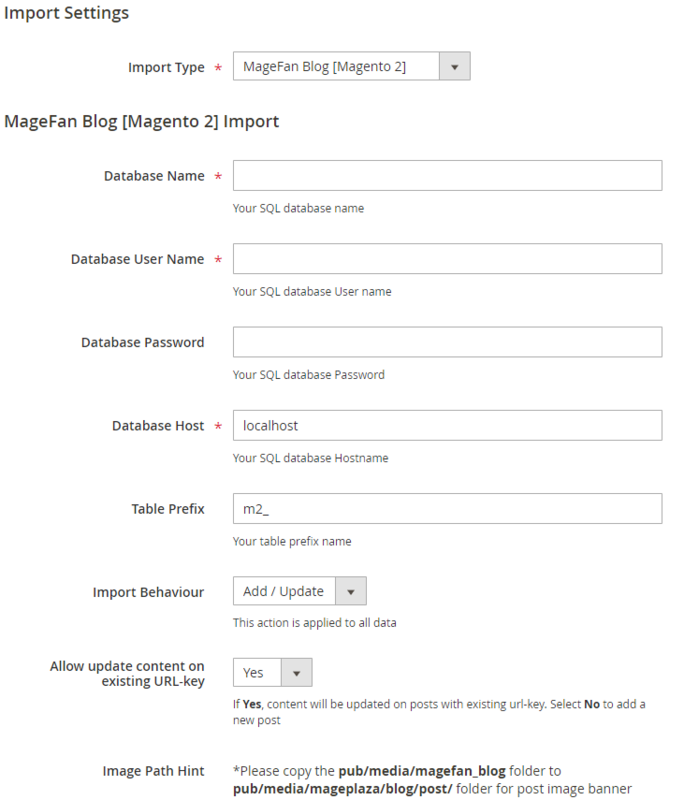 Login to Magento Admin, follow Content > Better Blog: Manage Posts. Enter Short Description if it’s necessary. Use WYSIWYG Mode to insert the post content that allows showing right as on the frontend. If you want to show the content under code, tap Show/Hide Editor button. Choose the Store View where you want to display the post. Upload image from your browser in the Image option. Choose Topic, Tag, Category for the post. Also, you can create a new Topic, Tag, Sub Category in this section. 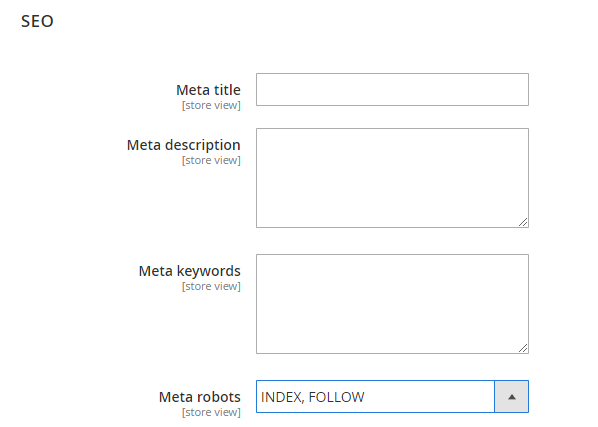 Complete Meta Title, Meta Description, and Meta Keywords for your better SEO. Tap Save and Continue Edit, then hit Save Post to finish. If necessary, you can assign the new tag to a specific post. Click on Save Tag when complete. Complete Meta Title, Meta Description,and Meta Keywords for your better SEO. If necessary, you can assign the new topic to a specific post. Click on Save Topic when complete. If necessary, you can assign the new category to a specific post. Click on Save Category when complete. Upload image from your browser in the Avatar option. When choosing “No”, the status of the default comment is Approved and it will display as soon as customers comment. After the customer comments a post, the comment will be sent to the admin with the status Pending. The comment is displayed if the admin switches the comment status into Approve, and in vice versa result if Status is Spam or Pending. Post: The post title which is linked to Edit Post of Manage Post in the backend. Status: Admins only need to select Status = Approved to allow those comments showing in the frontend. Content: Admins can edit the content of the comment at this field. The comment at the frontend will change as the backend. In the comment management grid, admins only see up to 150 characters of the content. View on Frontend: link of the post on the frontend. Widget is an awesome functionality you can insert to the CMS page from Magento 2 Configuration because it can be considered as a predefined set of configuration options. In the widget, you can add links that navigate directly to any content page, category, or product as you need. In Magento 2 Better Blog extension, you can add a widget in which shows Related blog posts, Lastest blog post, etc. Follow this instruction to learn how to create a new widget to enrich your content immdiately. Choose the widget’s type: We created an available blog widget. In Widget Type, choose Mageplaza Blog to use this widget for adding posts in the content of any optional pages. If you leave it blank, the widget won’t have a title. The default number is 5. If you leave it blank, there will be an error message. The Category ID will be expanded when you choose this option, then enter the Category ID you want to display in the blog. The default number is 2. You have to ensure that the Category you entered is valid. If it isn’t, there will be an error message at the frontend. You can check the Category ID in Mageplaza > Bettter Blog: Categories click the Category name to see its ID. We created a new default template and this is the only one you can use. Finally, click Insert widget button to add the widget into the content. Don’t forget to click the Save button at the top of the backend. Check the frontend to see the final result.